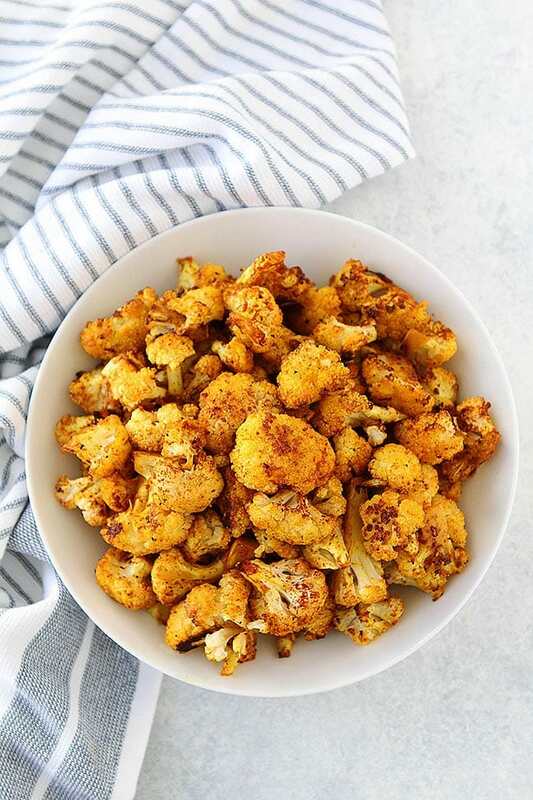 Turmeric Roasted Cauliflower is an easy vegetable side dish that goes great with any meal. This healthy roasted cauliflower recipe is vegan, gluten-free, and so delicious! We make it at least once a week! Roasted vegetables are my FAVORITE. I might even like them more than cookies. I know, that is a BIG statement, but I eat roasted vegetables almost every single day. I crave them every day and LOVE them every day. My day isn’t complete without roasted vegetables. I love roasting a variety of roasted vegetables, my Roasted Vegetable Quinoa Bowls are a staple, but sometimes I like sticking to one vegetable. It is nice to give one vegetable the spotlight from time to time. One of my very favorite roasted vegetables is cauliflower. 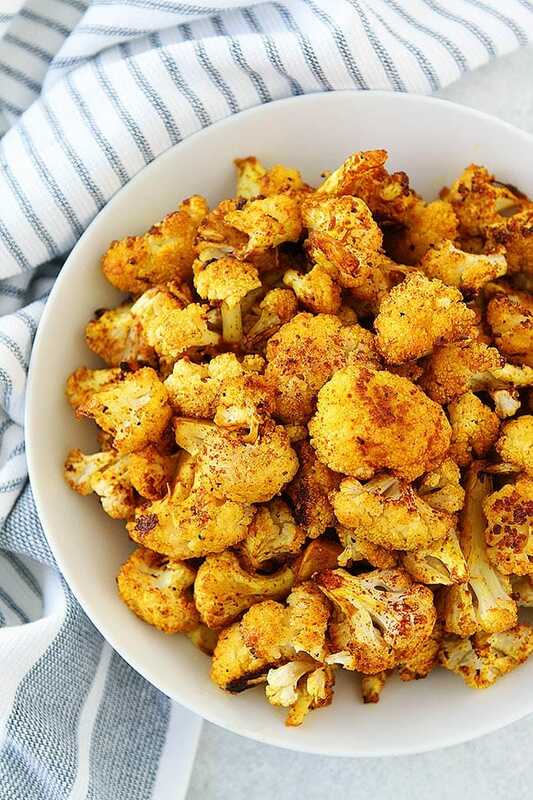 I am obsessed with all things cauliflower and roasted cauliflower is my favorite, especially this Turmeric Roasted Cauliflower. 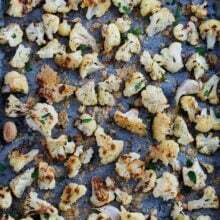 This roasted cauliflower recipe comes from the cookbook, Pretty Simple Cooking, written by A Couple Cooks, my blogging friends. I am SO in love with their new cookbook, it is filled with 100 delicious vegetarian recipes that are all simple to make. I am always looking for new vegetarian recipes and this cookbook is a winner! Preheat the oven to 450 degrees F. You want the oven to nice and hot so the cauliflower can roast and get crispy. Make sure you cut the cauliflower into florets that are all the same size. You want the florets to be the same size so the cauliflower roasts evenly. Flavor the cauliflower with garlic, cumin, paprika, turmeric, red pepper flakes, salt, and black pepper. Make sure the cauliflower is well coated with olive oil so the cauliflower will get crispy in the oven. Line a large baking sheet with parchment paper or a silicone baking mat so the cauliflower doesn’t stick to the pan and for easy clean up. Roast the cauliflower in the oven for 25-35 minutes, stirring once. I like to roast my vegetables for a little longer because I like them extra crispy. This Turmeric Roasted Cauliflower is a fantastic vegetable side dish. Serve it with pasta, meat, seafood, add it to a salad, or eat it as a healthy snack. I have been eating it for lunch almost every single day. It is one of my favorite vegetables! You will love the turmeric kick. You can find turmeric at almost any grocery store in the spice aisle. Turmeric is bright yellow in color and is the main spice in curry. It has a warm, bitter taste and contains a yellow-colored chemical called curcumin, which helps decrease swelling and inflammation. 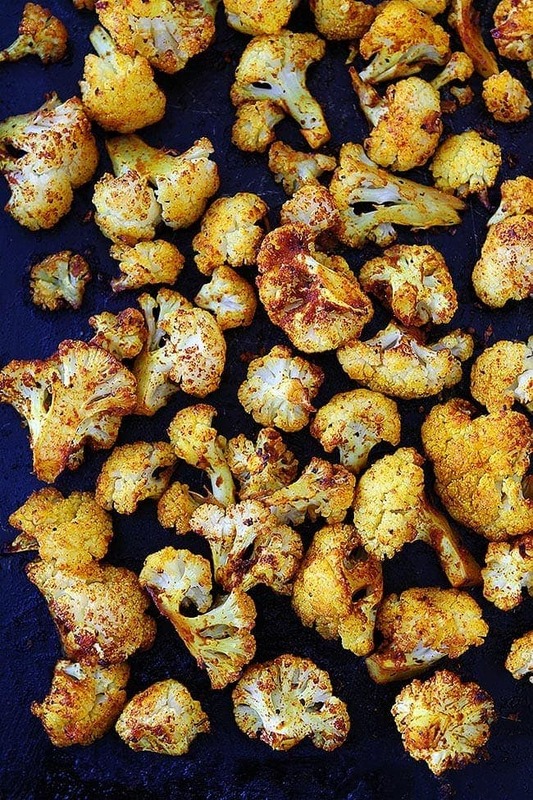 The next time you are going to roast up some cauliflower, make Turmeric Roasted Cauliflower. You will love this easy, heathy, and delicious vegetable side dish. And make sure you check out Pretty Simple Cooking for LOTS of healthy and delicious recipes! This easy roasted cauliflower is a fantastic side to pasta, meat, or seafood. It also makes a great healthy snack. Chop the cauliflower into florets. Peel and mince the garlic. 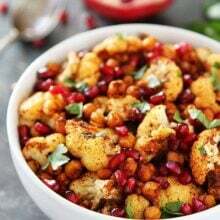 In a large bowl, mix the cauliflower and garlic with the olive oil, cumin, paprika, turmeric, red pepper flakes, salt, and black pepper. Line a large baking sheet with parchment paper or a silicone mat, then place the cauliflower in a single layer on the baking sheet. Roast for 25-35 minutes or until the cauliflower is tender and browned, stirring once. Serve immediately. Note-you can swap the red pepper flakes for 1 Fresno chile pepper, seeds removed, and minced if you wish. I just love their cookbook. Everything I’ve made so far has been FAB! This cauliflower is next on my list! This is so gorgeous! Hooray for new cookbooks! I always make roasted cauliflower, but never with turmeric!! Such a perfect side dish! This dish awesome. Thanks for sharing. I love one. I could eat the whole pan!! Perfect side dish for any meal! This was a quick and easy recipe. It came out great! Delicious! And easy. Will definitely make agian. This recipe sounds good, except for the large amount of minced garlic -wouldn’t that just burn at such a high temp for this amount of time? What keeps this from being Keto-friendly? Delicious! So flavorful and quick and easy to make! Will definitely be making this again! I had a hard time getting the cauliflower to reach a consistent size but the flavor was perfect. I made this recipe for the first time. The cauliflower was beautifully cooked and had a subtle tang because of the recommended seasonings. Our company loved this recipe as well. It was quick, easy, and healthy. I will definitely be making this on a regular basis. Very good! We loved it. My family and I absolutely love this recipe. 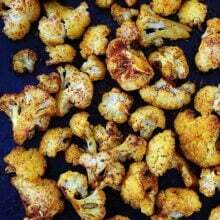 Roasting the cauliflower brings out the taste of the cauliflower and the turmeric and spices make it bursting with flavor. 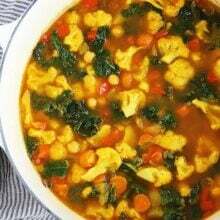 This is indeed one of my favorite cauliflower recipes. Thank you. Today Will be the second time I have cooked from this recipe. First time I included sweet potatoes. Both vegetables were delicious. 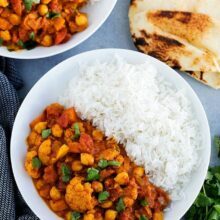 I am the food lover, I really like this recipe. thanks for sharing the information with us. 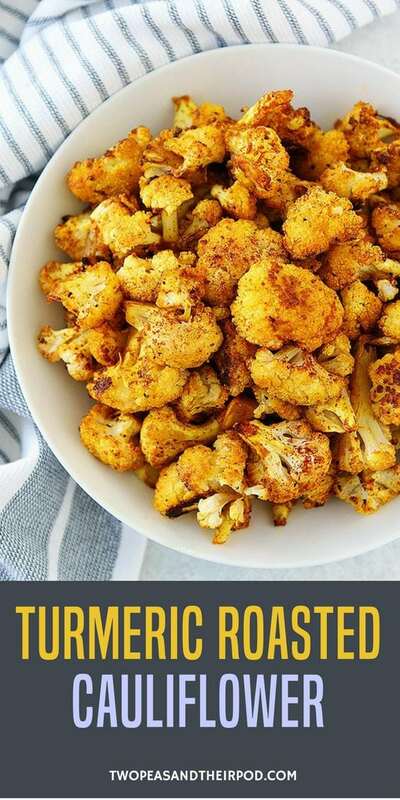 Amazon I am a food lover and this is really amazing and unique TUMERIC ROASTED CAULIFLOWER recipes. I will try this. could you prep this the night before? Will it taste too “turmuricy”? thanks! so glad I found your site!!! I think it will be fine!